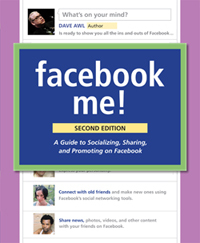 News Flash: Check out Dave's book, Facebook Me! for all the latest news, info, and discussion. or Powell's online, among other places. Yes, Dave is on Twitter! social media and training services, Awlpoint.com. Join the Dave Awl News mailing list for updates on Dave's various projects. The Partly Dave Show is on hiatus. Check out the "Totally Dave" feature on e-poets.net! by the jelly harvested from more than 1,506 distinct species of undersea donut, and maintained with the assistance of 47 translucent orange gas giraffes, under the supervision of the Transplanetary Manatee. end torture and detainment of political prisoners. Abolish the death penalty.